Learning often requires accepting that we could be wrong. Acquisition of new knowledge often requires that we have to let go of old knowledge. Learning something new therefore means that we need to accept that what we "knew" before was wrong, or not good enough, and that we need to know something new. Being Wrong is an uncomfortable position, and in many corporate or professional cultures, being wrong involves a loss of face. This is what we call a "Knower culture"; a culture where status is associated with being Right. In such a culture, being Right is expected; being Right is linked to position and power, and being Wrong is a bad thing. You can test the health of your KM culture by measuring how easy it is to be wrong. In a changing world, however, nobody can be right about everything. If our organisations are to learn, then the individuals within those organisations must become learners as well. To become learners, they must be willing to let go of being knowers, and must be willing to say "I could be wrong here - lets think about this some more". New knowledge is tested through practice, but it needs to be tested with an open mind, and with the acceptance that all knowledge is provisional and subject to improvement. It is the continual improvement of knowledge that is behind the continuous improvement of performance, and you cannot continuously improve knowledge without accepting that aspects of the old knowledge were wrong. This TED talk by Kathryn Schultz on "Being Wrong" is well worth watching, as she explores some of the barriers to, and advantages of, being wrong. 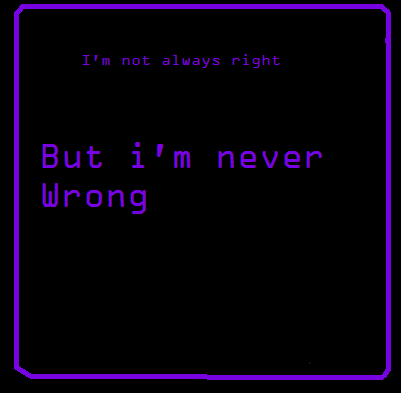 Let's dare to be wrong. Let's dare to learn.